Dog French Touch, the new French designer of "couture" dog clothing. Dog French Touch, the new French brand of luxury clothing for dogs, is all made in France. The French production is a guarantee of excellence and high quality, detailed-oriented work. Traditional know-how of our French regions, attention to fine materials and finishing creates exclusive, elegant and comfortable clothes, as seen in French fashion, just for our canine friends. 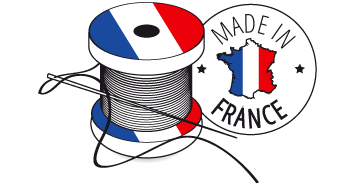 All clothing production stages are carried out in France: designed in Paris; patronage of the clothes, embroidering, labels and badges are completed in the region of Cholet; the clothes are finished in a designer fashion workshop in the Vendée called "L'Atelier Cuir et Mode" in Moutiers les Mauxfaits. The majority of our fabrics used is produced especially for Dog French Touch in the various French regions, including the Troyes Basin. The knitting snaps, stamped with the DFT seal, are shaped in the Lyon region.